Many believers would at least vaguely recognise this phrase. It of course comes from the Apostle’s Creed. But it has been the subject of much debate, and differing interpretations of it have been forthcoming over the centuries. Many believe it is a central aspect of Christian belief, while some believe it perhaps should have been left out altogether. Some even argue that it is a heretical phrase, and condemn the whole Creed as a result. So what are we to make of this phrase? Is it a helpful aspect of Christian belief or is it something to be avoided? As will be seen, translation considerations play a very important role here in answering such questions. Let me say a few brief things to begin with, and then seek to expand on this somewhat. One. The early church creeds, including the Apostles’ Creed, are not inspired of course, so we can agree to disagree on aspects of them. Two. That particular four-word phrase has been the subject of various debates over the centuries. One is not necessarily a heretic for having differing thoughts on it. Three. The Bible does in fact have numerous passages which bear directly on this concept, so it most certainly does have some biblical warrant. Four. As always, how we interpret these particular passages is of course the real issue, and that is where disagreements can and do arise. As with much of early Christianity, there is plenty of complexity and mystery as to how exactly the Apostle’s Creed developed and came to its final form. That history cannot here be traced, but see the bibliography below for works offering detail on all this. Suffice it to say that it certainly was in existence early on, certainly by the second century, but its final form may have only taken shape with Charlemagne by 813. As to the phrase in question, it seems that some of the earliest formulations did not contain it. The Eastern Orthodox Church was somewhat suspicious of it, at least early on, and put a strong emphasis on Christ’s victory over death. Except for the Anabaptists, most of the Reformers also accepted it. The Catholic church has also considered it to be an important early creed. But see below for more ways in which various churches have sought to understand the phrase. And it should be pointed out that this phrase is also found in another important creed, the Athanasian Creed. Matthew 27:52-53 The tombs broke open and the bodies of many holy people who had died were raised to life. They came out of the tombs, and after Jesus’ resurrection they went into the holy city and appeared to many people. 1 Peter 3:18–22 For Christ also suffered once for sins, the righteous for the unrighteous, that he might bring us to God, being put to death in the flesh but made alive in the spirit, in which he went and proclaimed to the spirits in prison, because they formerly did not obey, when God’s patience waited in the days of Noah, while the ark was being prepared, in which a few, that is, eight persons, were brought safely through water. Baptism, which corresponds to this, now saves you, not as a removal of dirt from the body but as an appeal to God for a good conscience, through the resurrection of Jesus Christ, who has gone into heaven and is at the right hand of God, with angels, authorities, and powers having been subjected to him. It is not my intent here to comment on all these passages. That would require many more articles to do them proper justice. And helpful commentaries will spend a fair amount of time on some of these more puzzling texts, such as the 1 Peter passages. This passage in 1 Peter is the one most debated and written about; from the earliest days of the church, it has been understood in very different ways. Even the usually dogmatic Martin Luther commented as he struggled with this passage, “This is a strange text and certainly a more obscure passage than any other passage in the New Testament. I still do not know for sure what the apostle meant”. Even among today’s interpreters this passage has the reputation for being perhaps the most difficult in the NT. Part of our problem in getting a grip on this phrase is the fact that we are having to work through at least four different languages: we have the biblical Hebrew and Greek to deal with, the Latin of the Creed, and then of course English, and the way it deals with words and phrases from the other three languages. The English is misleading, for “hell” has changed its sense since the English form of the Creed was fixed. Originally, “hell” meant the place of the departed as such, corresponding to the Greek Hades and the Hebrew Sheol. That is what it means here, where the Creed echoes Peter’s statement that Psalm 16:10, “thou wilt not abandon my soul to Hades” (so RSV: AV has “hell”), was a prophecy fulfilled when Jesus rose (see Acts 2:27–31). But since the seventeenth century, “hell” has been used to signify only the state of final retribution for the godless, for which the New Testament name is Gehenna. What the Creed means, however, is that Jesus entered, not Gehenna, but Hades—that is, that He really died, and that it was from a genuine death, not a simulated one, that He rose. Michael Bird takes it a tad further: “A better English rendering of the Creed would be something like he ‘descended to the place of the dead’ rather than just ‘to the dead’.” Thus the version many of us now have or are used to, referring to “hell,” is not so helpful, and a different translation is required to make better sense of it, and what the original authors intended. The issue still remains as to how we are to understand this phrase. The Eastern fathers such as Clement, Origen, Cyril and John of Damascus said that Christ in hell preached the gospel to evangelise the unbelieving dead. In the West, church fathers such as Augustine and Tertullian spoke of Christ descending to the lower regions to unite faithful patriarchs and prophets to himself. Tertullian (c. 155 – c. 240) for example could speak about Christ going to the “underworld” and “down to the regions beneath the earth” as part of this mission. Catholics take a similar sort of view, while Luther said this descent completed Christ’s triumph over Satan. Calvin saw it more as a symbolic image of the penal sufferings of Christ on the cross. This however is of course a very simplified and brief overview of a much more nuanced discussion. So much more can be and has been said about all this. More articles will be needed to take this further. Those familiar with historical theology and the original biblical languages realise that this is indeed a debatable phrase, with good Christians taking various positions on it. And the relatively sparse language in the Bible about what exactly happens after death but before the resurrection also means there can be some ambiguity here, as well as with the various terms used. Thus a bit of theological humility is always warranted in such circumstances. But because it is not part of the biblical canon, those who dislike it, or parts of it, are welcome to just ignore it if they must. It is not binding on anyone. But like many of the early creeds, it offers a helpful summary and exposition of basic Christianity, or what Lewis would call “mere Christianity”. William Barclay, The Apostles’ Creed. Westminster John Knox, 1967, 2005. Michael Bird, What Christians Ought to Believe: An Introduction to Christian Doctrine Through the Apostles’ Creed. Zondervan, 2016. Stuart Briscoe, The Apostles’ Creed. Shaw Books, 2000. 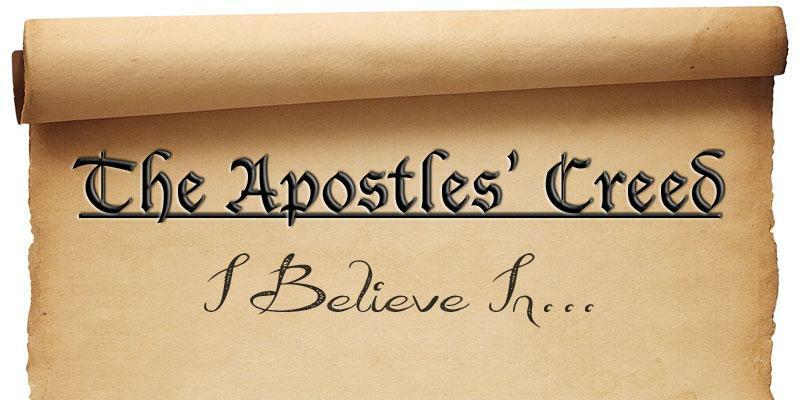 Michael Horton, We Believe: Recovering the Essentials of the Apostles’ Creed. Word, 1998. Daniel Hyde, In Defense of the Descent. Reformation Heritage, 2010. Justo Gonzalez, The Apostles’ Creed for Today. WJK, 2007. Alister McGrath, I Believe: Exploring the Apostles’ Creed. IVP, 1991, 1997. 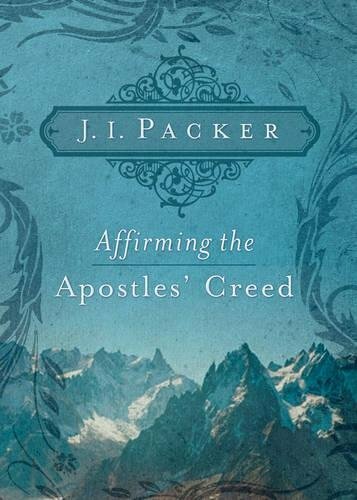 J. I. Packer, Affirming the Apostles’ Creed. Crossway, 2008. 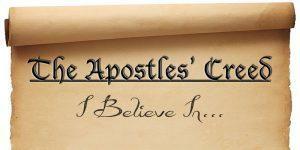 R. C. Sproul, What We Believe: Understanding and Confessing the Apostles’ Creed. Baker, 1973, 2015. Let me mention two quick things about the above volumes. While McGrath mentions the phrase, he nowhere discusses it in his book! And the Hyde volume, as the title suggests, is devoted entirely to explaining – and defending – the phrase. J. N. D., Kelly, Early Christian Creeds. Longmans, 1950. John Leith, Creeds of the Churches, 3rd ed. John Knox Press, 1963, 1982. Philip Schaff, The Creeds of Christendom, 3 vols., 6th ed. 1876, 1998. J. Stevenson and W. H. C. Frend, Creeds, Councils and Controversies. SPCK, 1966, 1989. Gerald Bray, Creeds, Councils and Christ. Mentor, 1984. Justin Holcomb, Know the Creeds and Councils. Zondervan, 2014. Carl Trueman, The Creedal Imperative. Crossway, 2012. In addition, one needs to consult the various commentaries on the relevant passages mentioned above to get much more insight – textually, linguistically, theologically, historically, and so on. Jesus redeemed us from the curse of the law, being made a curse for us. He was made a sin-offering, and He died in our place, on our account, that He might bring us near to God. It was this, doubtless, that intensified His sufferings and part of why Jesus said, “My God, my God, why have you forsaken me?” The sin offering was the slaughter of a spotless lamb. The lamb had to die for the forgiveness of sins-not go and rest somewhere for three days and come trotting back as a risen being. Physical death was necessary- in Hell/Hades. But death could not hold him (death, where is thy sting? )-He ascended into Heaven. And let us not forget, time in the spiritual does not equal time in the material world- three days in the material may be a second in the spiritual. Did Christ descend into Hell, yes- did He suffer there for 72 hours? Who knows. Remember, he promised His fellow crucified thief that he would be in paradise with Him-today. New Testament passages which approximate creedal statements without using the phrase “I believe” include: 1 Corinthians 8:4-6; 15:3-4; 1 Timothy 3:16. The Petrine passage about Christ preaching to the spirits in prison may have more than a little to do with Peter’s assertion in 2 Peter 2:4-5 that Noah was a preacher of righteousness. His audience, humans and “sons of God” were subsequently imprisoned in the realm of the departed souls when their disobedience to Noah’s message led to their untimely deaths at the Deluge. The Spirit of Christ would doubtless have inspired the preaching of Noah to his contemporaries. Another consideration in this difficult-to-understand passage in 1 Peter 3 is: When our Lord died on Golgotha, did He remain subject to the normal passage of time experienced in the history of living humanity, or did He enter a realm where past and future are merged in one eternal “now”? That the sacrifice of the Lamb of God has a dimension bigger than a certain day, year and hour in a certain year AD seems to be indicated by the wording of passages such as Revelation 13:8 and 17:8. Hi Bill, Glad for your wise words here. I would have thought you would have also quoted Jesus words to the thief on the cross from Luke 23:43 And he said to him, “Truly, I say to you, today you will be with me in Paradise.” (ESV) Where did Jesus go in-between his physical death and physical resurrection? It makes it plain to me at least unless people want to dismiss those words penned by Luke. Then given Jesus said “It is finished” it seems plain enough He didn’t need to do anymore for people who take the road to Hell by rejecting God. Like the Rich man it will be no good after your gone and you want to get a message to family who are still alive. The word Hades is used of the place where the rich man found himself! See Luke 16:22-23 The poor man died and was carried by the angels to Abraham’s side. The rich man also died and was buried, and in Hades, being in torment, he lifted up his eyes and saw Abraham far off and Lazarus at his side. Clearly physically dying can be seen as descending into the ground – buried. Adding that line about descending to Hell I think confuses the doctrine about what happened with Jesus then and by implication what happens when we die as to our spirits and the judgement. ‘Man is destined to die once and then face the judgement’ the author to the Hebrews mentions. So it seems plain enough to me – Hell is not the place anyone should want to end up and Jesus death and resurrection is such good news. Thanks Bill. An interesting article as a starting point. Its come for me at a good time as I am about to start a sermon series examining the Biblical truths as expressed in the Apostles Creed. I know for some of my congregation the phrase “he descended into hell” will be a discussion point. Being Baptists we aren’t particularly creedal and I’m sure there are quite a few who won’t know the Apostles Creed. Who is to say that the creeds WEREN’T inspired by the Holy Spirit? Surely believers can still be inspired by the Holy Spirit to teach theological issues today, as long as they don’t contradict the Bible? Thanks Kevin. But you are missing the point here because of some confusion over biblical words and concepts. We must define our terms carefully to avoid trouble. The word ‘inspire’ of course has different meanings. When we speak of the inspired Word of God, we have a particular meaning in mind. We refer to how God sovereignly worked with human authors to bring about the infallible 66 books of Scripture. “Oh, it says here that Jesus descended into Hell. Thanks Rob. Nice to have a lighter note now and then! That sounds right to me. Surely there is NO WAY Jesus would visit Hell and be the guest of Satan! It’s about time the translators sharpened their pencils and gave it another shot. Bill, first of all thanks for a great discussion on the Creed. I had never thought of it in terms of being inspired. I will undoubtedly read the article several more times to gain further understanding but before doing so I need clarification regarding your reference to Revelation 22:18 and it put the padlock on further inspired scripture. In that many scholars believe Revelation was written prior to other books of the New Testament it would seem that the verse is referring only to the book of Revelation itself. Thanks. Thanks Robert, but your claim is easy enough to answer. I am not aware of any credible and conservative New Testament scholar who believes that the book of Revelation was written before the rest of the NT. Quite to the contrary, all of the ones I am familiar with put it as the last of the books to have been written. The general consensus is that the NT was written between the early 40s and the late 90s. The gospels and Acts were penned between the late 50s and the late 80s, or possible early 90s (as in John’s gospel). Paul’s letters were written between the late 40s and the mid 60s. The other epistles were penned between the early or middle 40s (eg., James) and the early 90s (John’s epistles). Most NT scholars put the writing of Revelation at the mid-90s or later. None of this is fully set in stone of course, and discussions still take place on these matters. But the above is fairly standard dating for the NT documents. The deaths of the early writers is also a matter of some dispute, but if we ran with these commonly accepted dates or thereabouts, we would see how John must have been the last writer of the NT. Many experts put the deaths of James at A.D. 62, Paul at A.D. 64, and Peter at A.D. 65. John would have died somewhere around A.D. 100, likely of a natural death, unlike most of the others. –Canon Revisited: Establishing the Origins and Authority of the New Testament Books. Crossway, 2012. –The Question of Canon. IVP, 2013. I was once told that we should note the difference in Latin, which is “descendit ad inferos”, an “N” is missing, so not “infernos”. Alan A. Hoysted, Satan is not in hell – yet. Furthermore the thought that Satan is, or some day will be the ‘king of hell’ is erroneous. No one will be his “guest” in hell, rather all, whether angel or human, “will be tormented day and night forever and ever.” (Rev 20:10).